The carpal tunnel is found at the base of the palm. Several structures run through the carpal tunnel including the median nerve, which gives feeling and strength to the hand. 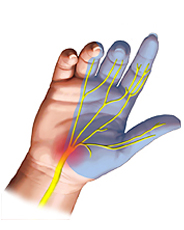 Carpal tunnel syndrome is caused by pressure on the median nerve. This may cause tingling, numbness or pain in your hand, wrist or arm. Over time the strength of your thumb and overall grip may also become weak. Tingling and numbness normally affects the thumb, index, middle and half of the ring finger, as shown. This is usually first noticed at night, causing people to wake up with a painful "dead hand". During the day activities involving bending the wrist or raising the hand above shoulder-height may also bring it on. In more severe cases the tingling and numbess are permanent, and may even shoot up the arm. Grip strength may be reduced, and people often report clumsiness of the hand, and a tendency to "drop things". Carpal tunnel syndrome can be diagnosed clinically by a specialist in hand surgery through appropriate questioning, and an examination of the hand. Occasionally electrical nerve tests are requested to confirm the diagnosis in unclear cases, or to check if other nerves are also involved. Most people find that their carpal tunnel syndrome gradually get worse with time, however there are also people who find that it doesn't seem to get worse with time, and occasionally it even gets better. What non-surgical treatment options are there? 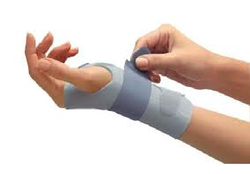 Wearing a wrist splint at night, which prevents bending the wrist whilst asleep, frequently helps with the tingling and pain, and improves a nights sleep. A steroid injection into the wrist can also improve symptoms for many several months,however this is not normally a permanent solution. A good response from a steroid injection is a good indication that surgery will also be successful. The purpose of surgery for carpal tunnel syndrome is to relieve pressure on the median nerve by dividing the ligament that forms the roof of the tunnel. The standard technique for dividing this ligament is through a cut in your palm just beyond your wrist. Shorter scars speed up recovery ,and over the years I have developed a short-scar carpal tunnel technique (the scar is usually around 2.5 long), and the wound is closed with stitches that are removed at 10 days to 2 weeks. I also prefer to perform the surgery without a tourniquet on the arm, which patients find painful. Instead I use a mixture of local anaesthetics with adrenaline, which is almost painless and reduces the risk of bleeding (see section on WALANT). An alternative is endoscopic carpal tunnel release surgery. A small cut is made on the forearm through which a telescope is inserted, and the ligament over the nerve is cut from the inside. This speeds up the recovery time as forearm scars are less tender than ones on the palm of the hand, however in the long-term outcomes between the two techniques are the same. This technique is not suitable for everyone, and your surgeon will discuss if you are suitable for this technique.